The German section is proud to be a member of the European Union of Women from the beginning in 1953. 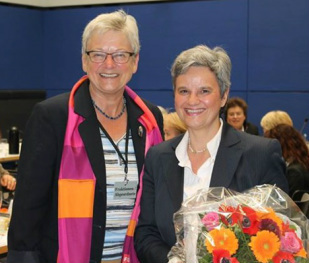 The German section is the common European “branch” of the Union of Women of the Christian Democratic Union (CDU) and the Christian Social Union (CSU, Bavaria). It is thereby integrated in the activities of the Union of Women and part of the political networks of their parties as well as the European People’s Party (EPP). to transmit information on European discussions and decisions to the women within our national and regional organizations. by taking part in the work of the EPP Women and their conferences, trying to link the work of the non governmental organisation EUW to the political organisation of Christian democratic women in the European Parliament.